A view across the fertile lands of the Parish of Arbory, with Colby village in the center. In the distance is the south coast and Bay ny Carrickey. The Parish of ARBORY was the departure point of many an emigrating QUALTROUGH family included in which was my ancestor James QUALTROUGH, his wife Catherine (nee CLAGUE) and their family who left the Parish in 1859 to travel to Liverpool to board the MERMAID to travel to New Zealand (See A QUOTA OF QUALTROUGHS). 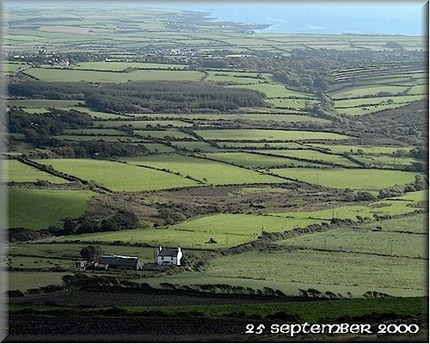 It is intended, like in the article on the Parish of Rushen, to give a glimpse of the area and what it was like in the 1800’s when many families left to try their hands in new lands. Its size alone will shed light on why many left as the population was rising and land became scarce to feed the large families. This description is compiled from THWAITES Isle of Man Guide and Directory, 1863. ARBORY PARISH extends about six miles in length, from north to south, and two miles in breadth, from east to west. On the north it is bounded by parish of Patrick, to the west by Rushen, the east by Malew and to the south by the Irish Sea. The Parish Church is situated about two and a half miles north-west of Castletown, in Ballabeg. The land is fertile and the farms well-cultivated. Among the principal land owners is one William Qualtrough. The population was at the time 1408. The main village in Arbory is Colby, a small rural place about a mile west of the parish church. Challoner states that the parish derives its name from the number of trees- arbour like. This, however, can only be a conjecture as there were few trees! 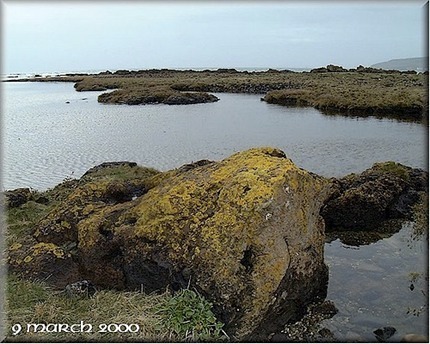 The more probable conjecture is that the name is derived from Saint Kiarbrey or Cairbri, one of the early converts of Saint Patrick, and this supposition is strengthened by the fact that on the ancient maps of the island, the name given this parish is Kirk Keirbrey, which doubtless has since been corrupted into Kirk Arbory. Aside from Rev John Qualtrough, the following members of the "family" lived in Arbory. So there you have it – a pocket-handkerchief glimpse of some of our ancestors’ home area. It certainly helps make one understand the reasons behind their push to move to new homelands, when the area of land is so closely populated. There hearts must have broken to leave behind their beloved Manxland, yet they knew that in the best interests of their families it was time to branch out to foreign lands. They were, like all émigrés, very brave in their undertakings of venturing into the unknown. And had they not made the choices they did back then, where would most of us of the Qualtrough clan who live in various parts of the globe, be today. One wonders! Submitted by Elizabeth Feisst, Australia.